This Grand Caravan is perfect for someone who needs a versatile family transportation but does not want to break the bank. On top of affordability you will appreciate the interior room, cargo space, and good fuel economy. Overall design of this Van is functional and simple. The interior is also well-laid out and features 'Stow 'n Go' 2nd-Row seats, which quickly fold into the floor to maximize cargo space without removing the heavy seats. Call us today to schedule your visit so you can see this family hauler in person. 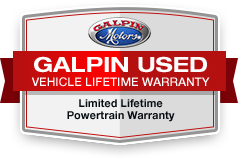 We are certain that you will love the 'Galpin Used Car Difference'! All figures are EPA estimates. Actual mileage will vary. Kelly Blue Book values are calculated based on the current Retail Book. Pricing analysis performed on 4/2/2019. Fuel economy calculations based on original manufacturer data for trim engine configuration. Please confirm the accuracy of the included equipment by calling us prior to purchase.